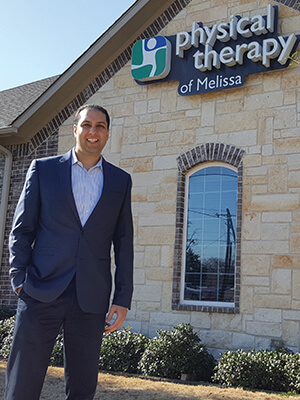 Nat Christadoss, PT, DPT, is a PPS member and owner of Physical Therapy of Melissa in Melissa, Texas. He can be reached at nchristadoss@ptofmelissa.com. Practice, location: Outpatient orthopedics. Melissa, Texas. Size of practice: Single practice with 10 employees. Most influential book: Financial Peace by Dave Ramsey. It was this book and seminar by Dave Ramsey that allowed my wife and I to be debt free prior to establishing the practice. We utilize the same principles with our business and I’m proud to say that other than mortgage payments, we are completely debt free. Favorite movie: Bad Boys I & II. Will there be a III? I sure hope so! How do you like to spend your free time? Love spending time with family and friends. Traveling to places and experiencing the culture firsthand. My wife and I went on our first mission trip with our church to Chennai, India, in January 2018. At home, I love to work on household projects as well as in my garden. I even do my own composting in my backyard! What do you like most about your job? The satisfaction of knowing that I’m providing our community the best health care option there is out there and enhancing their lives. What do you like least about your job? Third-party payers, their rates, and their obstacles. However, over the years we have learned to not tolerate rates below our cost. What is the most important lesson you’ve learned? We all only have a limited amount of time on this earth, so live today like there is no tomorrow. What is something unique about you that your fellow colleagues would like to know? My wife, Michelle, and I were featured on House Hunters in 2006 when we purchased our first home! What is something that you would like to communicate to your fellow PPS colleagues? We are all in control of our own destiny. What is it that you want for yourself and your future? Plant those seeds accordingly. Describe your essential business philosophy: “Work hard, play hard. Keep partying like it’s your job.” I believe that everyone does this in various ways (traveling, family time, friends, sports/recreational activities, hobbies, etc.). It’s important as entrepreneurs to rejuvenate ourselves occasionally to allow us to perform at our best. My wife and I learned this when visiting Ernest Hemingway’s home in Key West, Florida. He would write in the morning and fish in the afternoon. Describe your management style: Initially I was the micromanager that would constantly be behind my employees scrutinizing their every move. I quickly realized that did not work and now am more hands off, allowing my team to have more ownership with their roles. I manage these by reviewing key performance indicators with them routinely to ensure that productivity goals are being met. How do you measure or assess your success? My grandfather (an entrepreneur) told me when I was young that a true businessman can be anywhere in the world and still operate a successful business. I measure success when I am able to take a vacation while the practice continues to operate in a smooth manner. It’s a pretty cool feeling to be across the world and still make money! What goal have you yet to achieve? Achieving the $1M annual gross revenue practice by 2020. We’re on our way! What was your toughest decision? Our toughest decision was to know when is the right time to go out of network with a payer. We are about to go out of network with a payer that is close to 30 percent of our caseload. We know we will be losing some clients, but we’re optimistic that we will still retain those clients that know that our practice can provide better value and are willing to pay more to come to us. If you could start over, what would you do differently? Nothing. We started off the business with minimal loans ($40K), leased a small space with low rent, purchased refurbished equipment, and the only employees were myself and my wife. As we grew we purchased more equipment, hired more staff, and now own our 3,250-square-foot building.